This month I want to talk about systems thinking in the context of American relations with China and my experience working with China beginning the early 1980s. International trade is very much in the headlines these days. After a period of expanded trade agreements over the last several decades, the new administration in Washington is leaning towards protectionism. A review of NAFTA (North American Free Trade Agreement), involving U.S. trade with both Canada and Mexico, is currently underway in Washington, Mexico City and Ottawa. Meanwhile, as noted in Business Insider, President Donald Trump keeps threatening trade spats with China, and then retreating. However in August, in the first direct trade measure against Beijing, President Trump authorized an inquiry into China’s alleged theft of intellectual property from the U.S. When I was CEO of Applied Materials we invested in understanding and then cracking the technology markets in Asia, first in Japan and later in China. China was a tough challenge. In the 1980s the Chinese semiconductor industry was at a much different stage than in the rest of Asia. Restrictions on the kind of technology that could be exported meant that we could not even sell most of our products to China. The Cultural Revolution had eliminated a decade of engineers that could be trained in this newly emerging electronic world. There was little money to purchase anything. It might seem from all these factors that there was not much opportunity. We felt that there was. 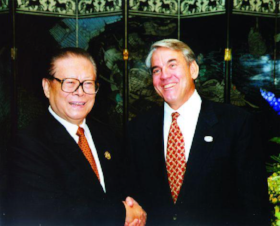 In 1983, China was still mostly a mystery and a complicated place to do business. But some members of our team had contacts within the Chinese Consulate in San Francisco. The Vice Minister of Electronic Industries, Jiang Zemin, visited the United States, mainly to stop at a few companies on the East Coast and Texas. * When our team learned that he was stopping in San Francisco on his way back to China, they invited him to visit us. While he was on site taking a tour and meeting with me, we received word that he had been promoted to Minister of Electronic Industries. On the spot we invited him to a celebration and we took the delegation of about twelve to Ming’s Restaurant in Palo Alto for a Chinese banquet. It was a memorable dinner in many ways. Jiang and I sat together and talked for about three hours. We discussed the outlook for Asia, the semiconductor industry, and the difficulties facing China. I was truly impressed with his experience. He had been educated in electrical engineering using English textbooks, he had gained experience in industry, and also worked for a time in the Russian auto industry. He spoke not only English, but Russian. In the three hours of discussion I perceived that despite our very different political orientations, our views about the future of technology were closely aligned. The Chinese are tough competitors. They’re getting ahead of us in certain technologies, for example solar panels and drones. They’re bypassing computers and focusing on mobile. The U.S. and China have to work closely together. We don’t want to make it too complicated. We need to have ways to address the differences between us. We need systems thinking— thinking about the whole system for long-term success. To thrive and succeed in a complex world, you can’t just slog forward every day checking off boxes in a linear fashion. You have to anticipate problems, process new variables, and adjust your strategy. By operating with an open mind and with respect for others, we repeatedly disproved the popular wisdom that U.S. companies couldn’t succeed in Asia. It reinforced for me that diversity is an exciting and enriching dynamic in life and I saw that play out every day in the many cultures that pulled together at Applied Materials. * Footnote: Yes, this is the same Jiang Zemin who became General Secretary of the Communist Party and President of The People’s Republic of China. How do you move beyond the day-to-day slog to embrace the larger picture?